Kakapo Rescue: Saving the World's Strangest Parrot by Sy Montgomery, photographs by Nic Bishop. (Grades 4-7.) Houghton Mifflin, May 2010. Review copy provided by publisher. In the lush, ferny forests of Codfish Island in New Zealand, there lives a very strange bird. It is green in color, blending in with the forest floor on which it lives. It is flightless and weighs up to 9 pounds. It comes out at night and smells of honey. It's a kakapo and there are less than a hundred of them left in the world*. The kakapo is one of many flightless birds that became threatened when humans invaded its territory, bringing with them many foreign predators. Its strong scent made it an easy target for cats and dogs, brought to the islands to hunt rats (which humans also introduced to the islands). Now, with so few kakapo left, it's up to humans to help out this dying species. First, the remaining kakapo were transferred to Codfish Island, a small island off the coast of New Zealand. It's carefully controlled - no tourists are allowed and the scientists and volunteers that work on the island must disinfect everything they bring with them. Scientists try to help the kakapo by supplementing their food to encourage breeding and keeping careful track of the few eggs and chicks that kakapo produce. It's slow going - kakapo don't breed every year and scientists are still trying to figure out what triggers breeding. But every little bit helps as they try to bulk up the population of these wonderful birds. This is another great entry in the Scientists in the Field series! Sy Montgomery's text is readable and accessible. Quick facts and short stories about the individual birds and people are presented in sidebars and inserts to the main text of the book. These inserts really help bring the kakapo to life and help the reader see that these strange birds, once kept as pets by travelers to New Zealand, do have distinct personalities. Of course, Nic Bishop's photographs of the flourishing landscapes are stunning, bringing you right into the heart of the issue. Also shown are photographs of some of New Zealand's other unique species. This'll be an interesting book for any young naturalist to pick up, but it may be especially useful when those trusty endangered species reports come around again. Kudos to Montgomery and Bishop for fleshing out the story of such a rare bird and bringing it to the attention of many. Just as you'd expect of any entry in the Scientists in the Field series, the book includes an index and resources for helping out the kakapo. Check out the website for the Kakapo Recovery Programme. Happy Nonfiction Monday! The roundup is at Rasco From RIF this week - go check it out! 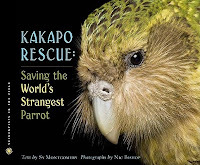 *At the time of the book's printing, there were 91 kakapo left. I see now from the Kakapo Recovery Programme website that there are over 100 birds living now! I love reading about the efforts to save endangered species. I have never heard about the Kakapo, but we have all heard its story- it's such a sad one- non-native predators and an expanding human population that brings in other dangers. Thanks for sharing this!